6 [[Underline]]SENATE FILE 77 WHAT CAN YOU DO ABOUT IT? [[end underline]] 1. [[underline]]SENATE FILE 77 - WHAT IS IT? [[end underline]] For over thirty years, the Federal Government has had low-rent housing program to help the poor, but Iowa is one of only five states to place an obstacle in the way. Under present Iowa law, cities must hold a public referendum, at which 60 per cent of those voting approve, before low-rent housing can be sponsored. An extensive survey of June 1970 on Housing in the State of Iowa initiated by the Community Action Project Directors showed that one-third of all Iowa's housing is dilapidated. The commercial landowner has not and cannot keep up with these urgent needs. Iowa is losing Federal Funds for housing that almost totally pay for housing projects. As of early 1970, Iowa had only 23 housing projects compared with Minnesota's 149, Missouri's 113, and Nebraska's 103. 2. [[underline]]SENATE FILE 77 - WHAT HAS BEEN DONE? [[end underline]] Senate File 77 passed the Senate by a vote of 33 to 11, but was not voted on by the House. 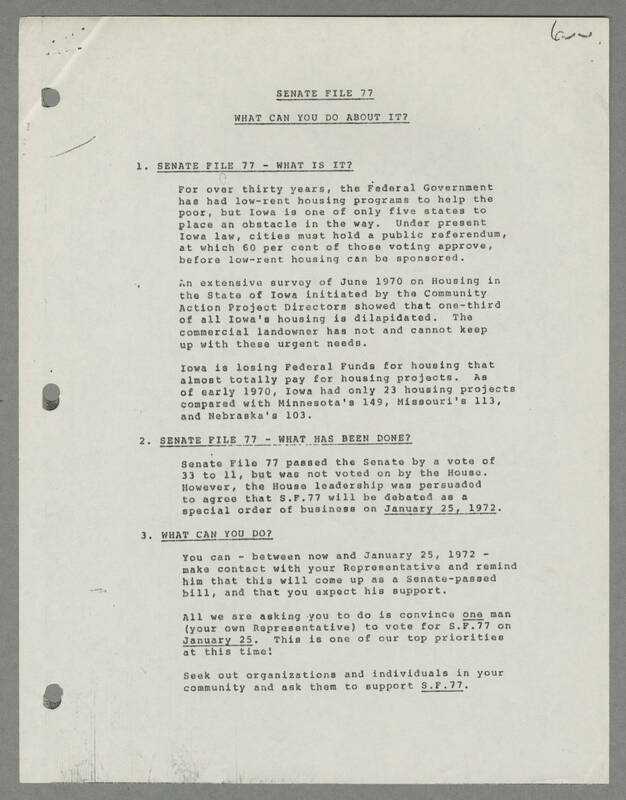 However, the House leadership was persuaded to agree that S.F.77 will be debated as a special order of business on [[underline]]January 25, 1972[[end underline]]. 3. [[underline]]WHAT CAN YOU DO? [[end underline]] You can - between now and January 25, 1972 - make contact with your Representative and remind him that this will come up as a Senate-passed bill, and that you expect his support. All we are asking you to do is convince [[underline]]one[[end underline]] man (your own Representative) to vote for S.F.77 on [[underline]]January 25[[end underline]]. This is one of our top priorities at this time! Seek out organizations and individuals in your community and ask them to support [[underline]]S.F. 77[[end underline]].